Win a sumptuous afternoon tea at Lough Erne resort! Lough Erne Resort, Northern Ireland’s first five-star resort, is offering one lucky reader the chance to win a decadent afternoon tea for two, curated by Noel McMeel and his team and served on the world-famous Belleek Pottery china. The picturesque backdrop of the Fermanagh Lakelands perfectly complements the hotel’s luxurious sofas and open fires. 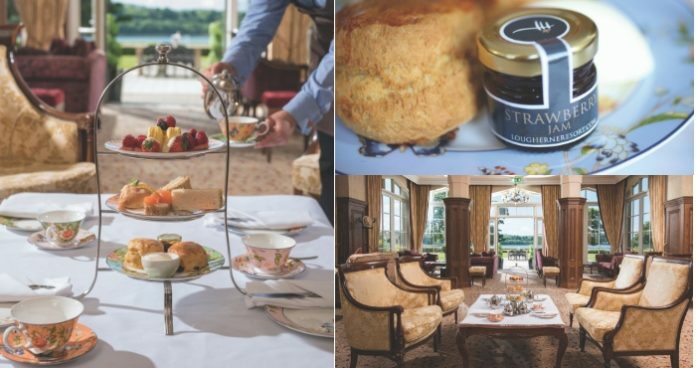 An enticing selection of finger sandwiches, pâtisseries and freshly baked scones served with homemade preserves and Irish whipped cream makes afternoon tea at Lough Erne Resort a truly indulgent experience. The classic afternoon tea is given a modern twist as guests can enjoy the addition of speciality tea menus, from classic Earl Grey to fragrant jasmine, luxurious Irish whiskey cream or chai. The resort also offers a ‘G & Tea’ option, giving guests the opportunity to combine sweet treats with a deliciously refreshing gin cocktail of their choice. Afternoon Tea is served daily from 2-4pm. For more information and reservations, please telephone +44(0)2866323230 or visit the Lough Erne resort website.